I have never heard so many people confess how afraid they were of the election results, and how if Hillary Clinton were to win, our nation's freedoms and perhaps existence would be over. The anxiety was high. The prayers were fervent. And 81% of evangelicals came out to vote for Donald Trump, thus answering their own prayers and preserving America and voting for personal liberties, the Constitution, and the American dream. Almost, to a person, I heard: "This was a miracle. God answered our prayers." How remarkable was this election? Democrats would have us turn our attention to the popular vote that they say Hillary has won, but the reach and impact goes much further. It has been and is a "movement" of and among the people. I think it was basically a spiritual movement, initiated in part by the prayer rallies Franklin Graham held in every state capital in America. As I talk to Christian friends, there is a joy, elation and even surprise that God answered our prayer and "saved our nation" from what most believed was what we deserved--a very dangerous and ungodly regime. I have not heard so much talk of "praise" to God from so many at one time, although many are quiet because they do not want to offend those who would not agree. This was certainly an amazing, historic "movement" of the people of this land, but I think it was also a movement of God's Holy Spirit as people prayed. The miraculous nature came about because the polls had so wrongly predicted a solid win for Hillary Clinton. I am reading from a book (I have to say "from" rather than a complete book because I rarely read cover to cover) about prayer by the classic prayer intercessor Andrew Murray. The book is called "The Ministry of Intercession." And Murray speaks in one chapter about how necessary the Father, Son and Holy Spirit--three in one--are to intercessory prayer. The "spirit" of intercession in prayer is actually the Holy Spirit at work. "It is only the healthy spiritual life that can pray aright. The command comes to each of us: 'Be filled with the Spirit.' That implies that while some rest content with the beginning, with a small measure of the Spirit's working, it is God's will that we should be filled [to the full] with the Spirit. That means, from our side, that our whole being ought to be entirely yielded up to the Holy Spirit, to be possessed and controlled by Him alone. And, from God's side, that we may count upon and expect the Holy Spirit to take possession and fill us...Let us, to say the very least, be willing to receive Him, to yield ourselves to God and trust Him for it. Let us not again willfully grieve the Holy Spirit by declining, by neglecting, by hesitating to seek to have Him as fully as He is willing to give Himself to us. ...let us believe that the Spirit of prayer, even in His fullness, is FOR us." As I have heard of many stories of churches praying, of individuals fasting and praying, and of even international groups in Jerusalem and elsewhere praying for the elections of the USA, I know none of us can take full credit. This has been God's grace and the working of the Holy Spirit to give America another opportunity to go to the right source, worship the right God, and pray to make America prosperous, safe, proud of what made us great, and united again. These are the goals that Donald Trump has been led, by God I believe, to focus upon for our nation. Please pray that the hundreds of evangelical leaders who have his ear and pray for him, that they may be part of a transformation of this wealthy businessman into a godly leader who will help Make America Great Again, in the best sense of the words. For a yr, off and on, I was praying Numbers 27:11-? Moses prayed the the Lord, Lord God, source of all life, I pray for a man who can lead the people of Israel/America, and can command us in battle, and that we no longer be like a sheep without a shepherd. Never did I dream of this outcome. I dreaded the whole day, sick at my stomach, not until 9:30pm did we turn on the tv. I did not go to bed until the President elect spoke. I did not want a nasty surprise in the morning! When I laid my weary head on my pillow, tears flowed and I truly understood how anxious I was over this election. Praise God! I agree so much. Thank you for all your prayers. I was very unsettled myself, trying not to worry, trying to trust God for the outcome. I left our Republican watch party about 10:30 PM, I think, and fell asleep on the couch watching the returns. I woke after 2:00 AM to the sound of Donald Trump's voice, giving his acceptance speech. What a beautiful sound! Keep on praying for our nation and for this election. Greater is He that is in us than he that is in the world. He is not the most perfect vehicle, but I believe God identified and chose a man in Donald Trump who could win over pure evil and take our country back. I have my tin foil hat on, wearing it proudly, and will take it off on Inauguration Day 2017. This is a very good prayer. I do believe that God is working through many evangelicals to help Donald Trump learn about religious freedom and salvation through Jesus Christ--our foundation. He appreciates their help. And I think Mike Huckabee has had a spiritual and moral influence on him for several years. That is one reason I would love to see Gov. Huckabee in a close connection such as Secretary of State, to have a Christian perspective on the world, as well as life, to give Donald Trump, and to keep him focused. It seems that the election was seen as a miracle by many people--something that had no chance of happening that did, and something that saved our nation from certain judgment had we gone the way of Hillary. But please keep praying. They still want to steal the election, now through calling everything "false," ("fake news," fake win, etc.). There is some sort of effort to create a problem with the electoral votes and disallowing the Trump win. Keep on praying. 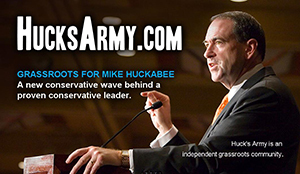 I had a longing this morning to communicate with my former HucksArmy friends. Maybe because I cannot remember the passcode for my Apple account I was trying to upgrade. It feels odd to be cut off. But it also tells me, maybe I--we--depend too much on communicating with the internet, the Iphone instead of the old, old-fashioned way of prayer with God. That is instant. It goes farther in the universe. It goes deeper in the heart. And a mightier force than any other can communicate back and affect change. Please continue to pray for the spiritual movement in America. We have seen signs of revival in America, especially in state capitals with Franklin Graham and others. But we have seen signs of decline in many traditional mainstream denominations. The last Values Voter Summit showed how young people are also finding a revival of interest in praying for our country and finding leaders who will stand for God and religious freedom and for principles. In the White House, cabinet level leaders are having Bible studies. One Christian leader said recently that 40% of Congress and the White House staff are evangelical Christians. May their numbers and influence increase. The greatest blessing may be that our President, while not often an example of Christlike behavior in the past, seems passionate about defending our religious liberty. He deserves our prayers as he stands resolutely for restoring America to greatness and "draining the swamp" of nefarious creatures and governmental agencies and people that want to abuse their privileges and the people of this country. Keep on praying for Mike Huckabee, as he takes a turn at another Huckabee show from Nashville, TN. He is fulfilling his dream, I think, to be a part of the music field, to promote Christian values in America and to provide clean entertainment and informative interviews of leaders regarding faith and government. I have missed you all and love you.